Thank you for visiting and enjoy all the free Gran Turismo 5 tunes! We have GT5 tuning for racing, drifting, rally, drag racing, and special built track tunes such as NASCAR and Nürburgring. We also have a guides section to give you a more in depth view on certain Gran Turismo 5 aspects you may be struggling with. If you enjoy the GT5 tunes, please be sure to like us on facebook and twitter. If you like the photomode in the game our tumblr has literally the best Gran Turismo 5 photos anywhere! 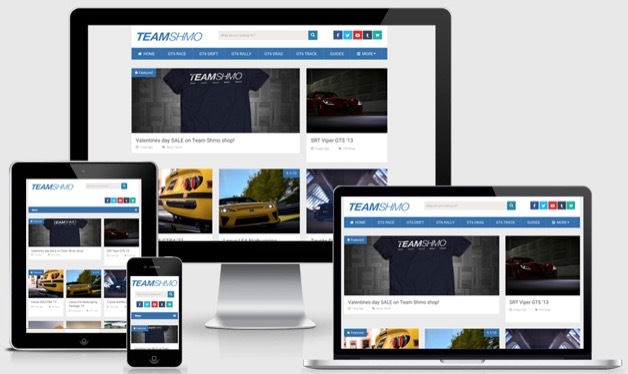 We are proud to present the official Team Shmo Store! Lot's of T-shirts, sweaters, accessories and many other automotive goods. These are primarily custom shirts designed by me, Shmogt, that literally no one else will have. Perfect for school, the car shows, summer time BBQ's, the gym, really anywhere where you need a shirt! We have a very extensive collection of Gran Turismo 6 tunes on ur new site as well. If you can't find the GT6 tune you are looking for, try a GT5 tune to see if it will work. Many times they will be very similar, but other times not so much. If you are searching for something very specific try the search bar or the manufacturers link. If you would like to know more about which aids I use, how to set a transmission, etc please view the TEAM SHMO FAQ as it answers all of that and more. team shmo has a new site! Thank you everyone for using the tunes and to make it even easier for you guys I have made a much improved website! The new site has a new domain at www.teamshmo.com and has a much needed improved search, a tagging system, and best of all looks great on ANY size device! All the GT6 tunes on this site have been already moved over, but don't worry since any link you have have saved or any link you click here or somewhere else on the internet will take you to the new version of it. This site just has GT5 tunes left (look on the right side for link) and this main page telling everyone we have moved. It was difficult to find certain tunes on this site like 500pp tunes for example, but with the tagging system you can just search for "500pp" and it will bring up all the 500pp tunes. I also have added the tags to anything that might be close to 500pp that you can use and just lower the power on to hit the PP level. Same goes for the region the car is from whether it is US, UK, Italy, etc. If you have any questions be sure to ask on the Team Shmo Facebook page. I needed a 550pp rally car for seasonal events and decided to go with this one. I love the old school Impreza's a lot and the rally version of them is the true blood of Subaru. It is no wonder Subaru dominated rally for so many years. This car/tune is pretty amazing at rally. Most rally cars feel like rally cars as if they are driving on ground that just isn't stable however this car feels like you are driving on a normal tar track. I drove the latest seasonal event and got gold like it was nothing. I'm sure with some practise anyone can easily be really good at rally with this car. At this lower pp level it is the perfect blend of power to weight. Should work great for all other rally seasonal events and of course lot's of fun for just general rally racing. A lot of people complain about how a car sounds in GT6 and I will have to agree with them. A lot of muscle cars have no roar, race cars will sound like vacuums, 1000hp cars sound like they are scooters. It's just not what it should be. However I have set out to change that with this tune. It is the first tune (as far as I am aware) to be made just for sound purposes. Each part was hand picked and test in order for it to sound the best. Of course being a Team Shmo tune it also has to drive well and be pretty fast. It has exact 450hp and is very light making it no slouch when it comes to the track. The suspension has been tuned to allow anyone to jump in and drive the car without any problems. I primarily use this as my cruise car. The one that you just like to drive and that is your only reason for driving it. It looks stunning with just the right amount of chrome, the exhaust wow me every time I see it, and now it even sounds great. My favorite way to drive this car is from the behind the car view. You get to look at the exhaust the entire time and it just sounds epic now. I made a quick video showing off the sound. Just listen to it as the car flies by. Downshifts too are quite nice. Bonus footage at the very end doing donuts and revving to get the full effect. One of my favorite race cars and perfect for 600pp races. I was sick and tired of all these 600pp race car seasonal events and i never had any cars to race with. I looked at some race cars that I thought would be good and this is one of the lightest and most hp race cars for this pp that you can buy. The best part is you can paint it whatever color you want. As I am sure most of you have noticed that usually isn't the case for race cars. Stock matte black is an option which already looks awesome so I left it like that. The shape of this car looks like a stingray and in the matte black paint it just looks too good. I call this car "Black Swan" (like the movie) since it is very delicate and graceful when driving it. You aim it anywhere you want and the car will go there. The control is unreal. At the same time if you aren't at the top of your game it can get crazy real fast. I think wheel drivers will like it since you barely have to turn the wheel for it to make pretty sharp turns. Remember it has a low rpm turbo meaning most of the power is in the lower rpm range. Be careful when in gear 2 when exiting corners because if you slam on the gas all the power comes at once making the tires spin too fast potentially causing you to spin out. Also if you are in higher gears shifting a bit before the redline will keep the power coming and let you accelerate faster than if you waited for the full range of the rpm. I love the car and it's perfect for seasonal events. The GTR Killer 2! The GTR Killer is one of the most popular drag cars I ever made. I have been online with it and people already know exactly what it's capable of. That car is a true beast which I thought was one of a kind until now. A new beast has risen to the challenge. The Infiniti FX45 Concept '02 is a car most people would not expect to be that great, but with this tune it will pull blisteringly fast times. I can do about a 7.8sec in 1/4 mile which is very fast for a super car, but 10X more mind blowing in an SUV! I promise you will smoke most people online, but again like the last one the GTR Killer name is factual in that I have actually beaten GTR's with it, but anyone with a really great tune is still going to win. I think the first GTR Killer may be a bit faster as it weights much less, but this has more hp. Would be an interesting battle to see who comes out on top.